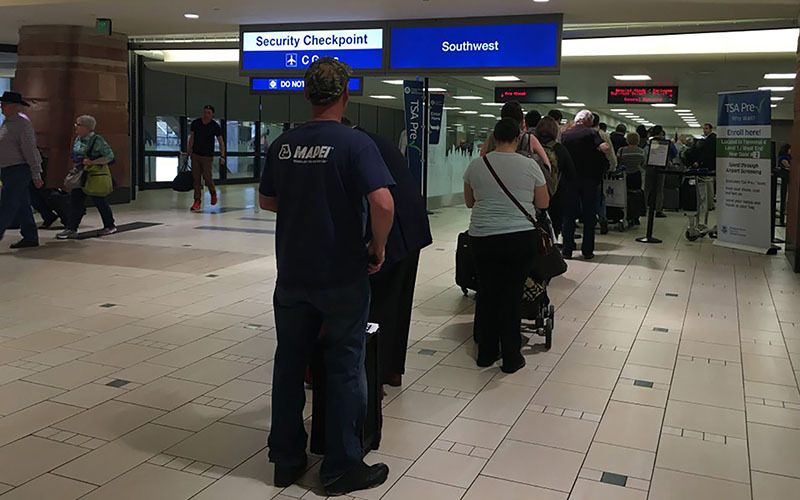 WASHINGTON – Phoenix Sky Harbor International Airport is expected to be among the 10 busiest airports in the nation this Thanksgiving, when as many as 27.3 million people are expected to board a U.S. airline for their holiday travel. The total number of travelers is up by about 55,000 passengers per day for the 12-day travel period from last year’s holiday, when 26.6 million passengers traveled on those airlines, according to projections Wednesday from Airlines for America, a trade group for U.S. carriers. Airlines for America Vice President John Heimlich attributed the surge to affordable airfares, and said airlines have prepared for more holiday travelers by offering 74,000 more seats per day than they did last year. The 10 airports that are expected to see the most Thanksgiving travelers, according to Airlines for America. Sky Harbor was not in the top 10 last year, according to an Airlines for America spokeswoman, but an official at the airport said they are working now in anticipation of the busy holiday surge. “Our staff works closely together to ensure that we have staffing to meet our travelers’ demands,” Sky Harbor spokesman Greg Roybal said in an emailed statement. Heimlich said U.S. airlines are expected to carry an average of 2.27 million passengers per day over the holiday travel period that spans Nov. 18 to Nov. 29. He said Thanksgiving Day is expected to be the lightest travel day in that period while Nov. 27 – the Sunday after Thanksgiving – is expected to be the busiest. Roybal said the recent construction at Sky Harbor will not interfere with holiday travel because tenants and contractors work together to ensure construction impacts are minimized. “Our construction projects, such as our Terminal 3 modernization project, are conducted in phases in order to minimize impacts to our customers,” he said. The Airlines for America report said the volume of travelers, and the time it takes to funnel them through security checkpoints, are not as concerning as the possibility of bad weather delaying flights. Weather cannot be controlled, but security procedures can, and Heimlich said gains in that area should help this Thanksgiving. Heimlich said the nine airlines in the association that have reported third-quarter results, have been spending a combined $3.6 billion per month on their workforce and continued adding staff in 2016. The extra staffing, along with new technology, should help keep fliers moving.